The Pearl Harbor memorial was moving. The story was familiar, but the images were still intense. My daughter didn’t want to go to Pearl Harbor. “But you need to see it. It’s an important part of history.” “I know the history, but I don’t like it.” Me, either. War is full of heroism and triumph, but it’s full of tragedy and cruelty, too. Seeing the Pearl Harbor memorial forced me to think about that past, and made me cry. As it grew close to time to head back to the bus, it struck me that every sign was in English — unlike our Disney hotel here in Hawaii, where most signs are in English and Japanese. 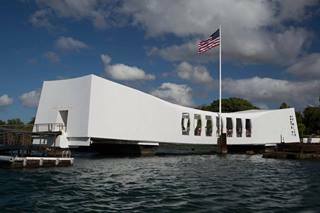 I wondered if Pearl Harbor would be on the list for a Japanese tourist in Hawaii. Hiroshima certainly wasn’t on the list for me when I went to Japan. I like Japanese culture, and being reminded of the political realities of my grandfather’s time is uncomfortable. I wandered over to the gift shop — what on earth could they be selling that an empathetic softie like me would want to buy? I couldn’t imagine. And then I spotted it: a coffee table book, entitled “The Art of Gaman”, about the beautiful art created by the Japanese Americans who were sent to internment camps. The text told me more about that less familiar, tragic story. I knew one of the camps had been in Owens Valley, near my old haunting grounds in Death Valley National park, but the book told me about the other locations. It told me how the Issei — displaced from their homes, and then their familial rank once in the camps — were the ones who most often made these beautiful pieces of art from scrounged objects. Best of all, my new book gave me a new word for my tiny Japanese vocabulary. Gaman: enduring the seemingly unbearable with patience and dignity. What an amazing word. And so like the Japanese to capture something so spiritually intense with so few syllables. Should I have expected less from the creators of zen? In a few days, I’ll go home, and when I commute, I’ll resume my Pimsleur lessons in Japanese. I don’t think gaman will be part of the conversational vocabulary, but no matter. Pearl Harbor has renewed my enthusiasm to be able to speak Japanese. Whenever tourism brings us together, I want us to be able to have the friendly exchanges that our grandparents couldn’t have. This entry was posted in grief, hope, politics, travel. Bookmark the permalink.